Favorite Line: "I want to have adventures, far away from here." The playing fields of Rookwood did little to prepare reluctant spy Harry Brett for the moral no man's land of post–Civil War Spain that awaits him in this cinematic historical thriller from British author Sansom (Sovereign). But those halcyon days have made him one of the few people likely to win the confidence of fellow old boy Sandy Forsyth, now a shady Madrid businessman, Franco associate and object of intense curiosity to British intelligence. Despite his reservations, Brett—whose best friend from Rookwood, Bernie Piper, disappeared in Spain a few years earlier while battling Franco with the International Brigade—accepts the assignment as his duty, and almost as swiftly regrets it. For the Madrid he finds has become a mockery of the vibrant, hopeful place he and Bernie visited during the dawn of the Republic. As in his Matthew Shardlake mystery series set in Tudor London, Sansom deftly plots his politically charged tale for maximal suspense, all the way up to its stunning conclusion. A bestseller in the U.K., this moving opus leaves the reader mourning for the Spain that might have been—and the England that maybe never was. I was thrilled to be contacted by FSB Associates to review this book. Not only because free books, as a rule, excite me, but also because C. J. Sansom is an author with whom I am familiar, having read two books in his Tudor mystery series starring Matthew Shardlake. If you are interested in Tudor England, particularly the court of King Henry VIII, then I would highly recommend the series (there are now four books). Winter in Madrid is not Tudor-ific, though. It is set mostly in Madrid after the end of the Spanish Civil War. There are blurbs on the back cover that basically compare the book to every other novel written about Spain after the Civil War (including my personal favorite, The Shadow of the Wind). I don't think this is a fair comparison; not because Winter in Madrid isn't good, but because I don't really see much similarity between it and The Shadow of the Wind or much by Ernest Hemingway. 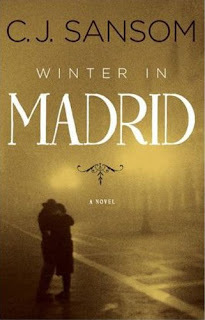 I enjoyed Winter in Madrid because its characters were all so very flawed. I didn't love any of them- and more surprisingly, most of them didn't even seem to like each other. This led to some awkwardness in scenes, but in general, it was more interesting than awkward. And for all the book's being set in Spain and being about intelligence operations with Spaniards and the clash between Communism and Fascism and the poverty and pain the Spaniards faced... let's be honest, this book is all about England. The end of English imperialism, the English class system, English idealism about sharing their society with the world, etc., etc. The plot of the book is WWII-era political intrigue and thriller, but the over-arching theme is about sunset falling on the British Empire, as played out by three boarding school alums and a lonely Englishwoman. Personally, I think the theme had a great deal more depth than the plot- but maybe that's because I'm so fascinated by English history. I also think the Spanish Civil War is overshadowed by World War II, so it was great to read a book that was set in Madrid during this time. It is fascinating and horrifying to read, especially when I compare the Madrid in the novel to the city I visited several years ago, and loved. It's amazing to see how people can rebuild and overcome such atrocities in their history. But maybe that's also part of the reason that subsequent generations are dulled to the pain of the past- because there are so few reminders of what happened. I enjoyed the book, though it took me some time to read. At over 530 pages, it is a bit long for a political thriller, especially as it isn't fast-paced. But it reminded me of the film noir that was so popular at the time, and the pace of the story fit in very well with the era. I enjoyed it, and if you read it, I hope you'll share your thoughts. I've just picked up this book from the library. I am very much looking forward to reading it. Wonderful review! FBS had asked to review this book as well but I knew I wouldn't be able to read and reaview in a timely fashion. I a bit over commited with ARC at the moment. I do have it on my TBR. I do like Sansom, and though this is a departure from what he usually does, it sounds like something that I would find interesting. Thanks for reviewing this one, I had been wondering about it. I've been considering this one for a WWII challenge. It does sound good, and I have to admit that I'm drawn in by the cover and your review!